I promised you more pics and here they are! 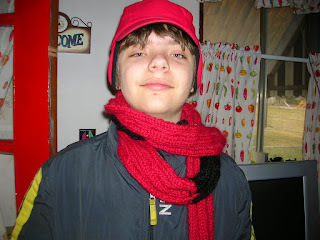 First we have Simon, sporting the new red and black cabled scarf I made him. He loves it! It's from Baby Alpaca Grand, just like the scarf and hat I made my dad. 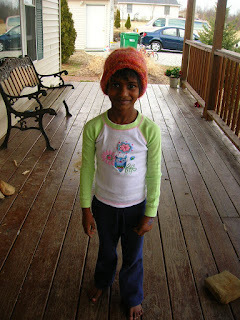 Here is Kushi, the newly adopted daughter of our friends, the James'. She is absolutely delightful, and is still learning English (being newly moved here from India). She's wearing the sweet little hat Megan made for her. Having never seen snow before, Megan tells great stories of Kushi needing to be convinced that she needed pants and socks and boots to go outside last month. She does seem to like the hat, though, but the shirt and pants she has on the in the picture were the 3rd or 4th outfit we saw her in that afternoon. She loves wearing pretty skirts! This is Megan, taken by Kushi. She really liked using the camera. I bought this beautiful yarn at the Merc when Cider Moon was having their trunk show there. It's some of the most wonderful yarn I've ever used. 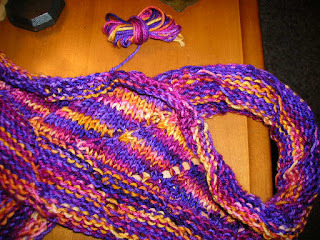 I absolutely adore the colors and have been fondling it for a long time trying to decide what to make. 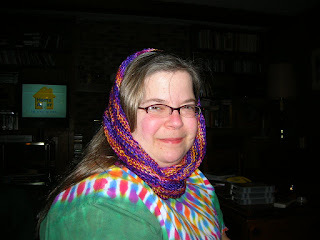 I finally settled on the moebius cowl. I added some extra stitches to the circumfrence and I wish I'd had a second skein because I was hoping for more of a shawl-like garment . 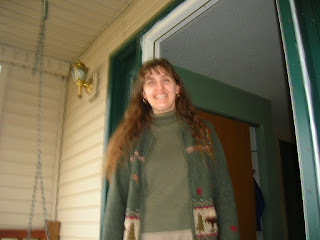 . . but as you can see I used nearly all the yarn and the scarf is only about 8 inches wide. Next time I"ll get 2!!! And before you say anything don't worry - I know it doesn't go so well with my tie-dye. I am still thoroughly in love with knitting moebius'. More pictures tomorrow and I think I'll be caught up!